Is Immigration Reform Really Coming? Continued racial profiling and record deportations lead some to believe that immigration may not be solved anytime soon. Immigration advocates eagerly braced for President Obama’s first press conference of the year this week. Most knew the economy and gun control would be central to the remarks he issued Monday, but hoped immigration reform would be acknowledged as well. After all, The New York Times had published an article over the weekend that detailed the ways in which Obama plans to swiftly push for a complete immigration overhaul in the coming months—including a clear pathway to citizenship. Just last week, the arrest and almost immediate release of a young immigration activist’s mother and brother illustrated the haphazard ways in which Immigration and Customs Enforcement, or ICE, often operates. Moreover, lawmakers on both sides of the aisle concede that the Latino vote was crucial to Obama’s re-election. And those voters desperately want Obama to make good on his longstanding promise to reform immigration. But Obama mentioned immigration only once in passing during his opening remarks on Monday. The White House press corps asked seven questions: four on the economy, two on gun control and zero on immigration. For some immigrant rights activists, the little Obama did say on immigration was thwarted by what he didn’t say instead. Carlos Garcia works with Puente, an Arizona-based human rights group that focuses on immigration. 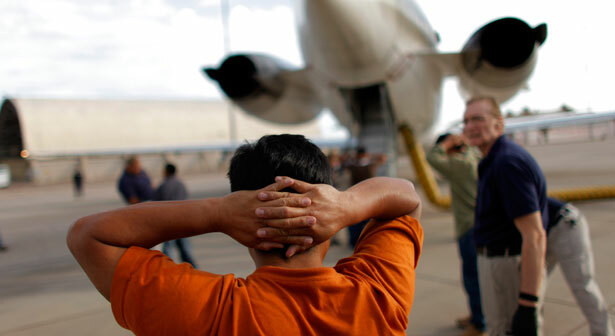 In 2010, Arizona became the center of the immigration debate after the passage of SB 1070. Garcia says that today, few people think about the way that racial profiling, raids and deportations have become a way of life there. Two weeks ago, an inmate died in Sheriff Joe Arpaio’s infamous Tent City jail. This week, ICE conducted a home raid that may end in the deportation of a low-priority immigrant whose young daughter is currently hospitalized for asthma. And just yesterday, Arpaio conducted a raid in a supermarket. Garcia says he’s disappointed that Obama didn’t make any tangible statements on how to move forward on immigration during his press conference. “Coming out of the last election, everyone expected immigration would be a priority, and that Obama would outline what would come next,” he said. A record 409,849 people were deported last year alone—and more than 1.5 million undocumented immigrants have been removed since Obama first took office. Despite ICE’s announcement that its agents should exercise prosecutorial discretion for low-priority cases, and Obama’s move to allow temporary deferred action for young undocumented immigrants, a good number of those being deported have no criminal record. Some arrived to the United States as children, called this country home and were deported to places they don’t remember. Meanwhile, if immigration overhaul legislation is introduced soon, it will likely contain elements unfavorable to some groups of undocumented immigrants. Democrats have already signaled that increased enforcement will be part of any comprehensive bill, and some Republicans may be reluctant to create any path towards citizenship. Garcia says that too many people are talking about immigration reform as a given—but that nothing’s guaranteed. His group will continue to draw attention to the ways people in Arizona and elsewhere face constant harassment and deportation, with the hope that lawmakers will outline positive and concrete steps to solve a broken immigration system. Despite avowals of "prosecutorial discretion," ICE continues to raid homes and workplaces across the country. Read Aura Bogado's chilling account of an arrest-turned-release.